A confession: I very nearly became an Arthurian. Before you all run off into the hills, screaming hysterically, bear with me for a few minutes. Remember that I originally come from Carmarthenshire – Caer Myrddin, the fort of Merlin, right? So the Arthurian myths and legends were all around me from pretty much as far back as I can remember. The Sword in the Stone was the first film I ever saw in the cinema, aged about six, and by the time I was eighteen, I’d read Geoffrey of Monmouth and The Once and Future King, been vaguely irritated by the TV series Arthur of the Britons, and wondered why on earth some of my sixth form friends insisted we should go drinking in the King Arthur Hotel on the Gower Peninsula, rather than in the (literally) hundreds of pubs that were nearer. Then I went off to Oxford, where my first term studying ‘modern’ history included the Venerable Bede (note: Oxford University has always had difficulty with the concept of ‘modern’) and his ‘back story’ in the writings of Gildas and Nennius. So when it came time for me to choose my options within ‘English One’, the vast English history paper (note: Oxford University has always had difficulty with the concept of ‘British’) that stretched from the fall of Rome to about 1500, it was a no-brainer – like a shot, I was off to what it was then still politically correct to call ‘the Dark Ages’. I decided I’d really impress my tutor by spending the vacation beforehand reading the new, exciting book about the period, namely John Morris’s Age of Arthur. I was instantly enthralled. Here was a whole new world, a thrilling combination of dramatic narrative and detective story, full of unfamiliar evidence and thought-provoking analysis. I was vaguely aware of the fact that Morris – coincidentally, an alumnus of my own college – had stirred up some controversy, but no matter. It was the newest, biggest book in the field, and I was still of an age when my assessment of history books began and ended with the questions ‘is it new, and is it big?’. Fortunately, my tutor on this course was the ideal man to put me right: James Campbell of Worcester College was a formidably erudite don of the old school, and he alerted me to the devastating critique of Morris penned by David Dumville of the University of Cambridge (note: Oxford University has always had difficulty with the concept of ‘Cambridge’). So off I went to other tomes, such as Leslie Alcock’s Arthur’s Britain, which gave me a very different, archaeological, perspective on the period, and I emerged from the experience a wiser and distinctly more sceptical person, at least when it came to all things Arthurian. It was also an object lesson in ‘how to do history’ more generally. For example, endless pages of references impress the credulous and are often intended quite deliberately to intimidate the sceptical into submission, but they don’t mean a thing if the references are to sources from long after the period they’re meant to be describing – a particular fault of The Age of Arthur – or are simply cross-referring from one dubious secondary source to another in a vicious circle of obfuscation. These traits are all too common, for example, in the work of many of the more controversial World War II ‘revisionists’, conspiracy theorists, and many of those writing books about such esoterica as the Holy Grail. (For my sins, I read quite a lot of the latter when researching my own venture into the reasonably esoteric, Blood of Kings, and quite a lot of the former when I was trying to steer impressionable GCSE students away from such things in the relatively early days of the Internet.) As Sam McLean said in his thought-provoking guest post here last week, historians don’t end their arguments with QED, but that can be part of the problem: all too often, those who think they are historians, or even genuine, qualified historians who should know better, ‘prove’ their cases by citing highly dubious ‘sources’ that actually prove nothing whatsoever. At right, the Coop House, which is exactly where it should be. At left, a large fallen tree, which isn’t. All of this came back to me in spades the week before last, when I was staying at the Landmark Trust’s gloriously eccentric property, the Coop House, near Carlisle, to brainstorm the plot of the next Quinton novel – which will be a radical departure from the series so far, but more of that anon. This proved to be a memorable week in more senses than one. Yes, I made terrific progress with the plot, although the details need to stay under wraps for quite a while. But some of that progress was made by candlelight: the storms that swept across northern Britain on the Thursday of that week brought a huge tree crashing down onto the power line to Coop House, blowing the transformer and plunging me temporarily back into the 17th century. To get back to King Arthur, though: the Coop House is in the parish of Arthuret, a pretty suggestive name to begin with, and the location of not one but two important battles – one in 573, not long after the time traditionally regarded as ‘the age of Arthur’, and the battle of Solway Moss in 1542. I always like to research an area before going there, so inevitably, I delved into the history of Arthuret. Pretty soon, I was lost in the darker undergrowth of the Arthurian forest (which, of course, is situated next to the Holy Grail sausage factory and the Templar vomitorium), ploughing through books and blogs which made the most astonishing claims. 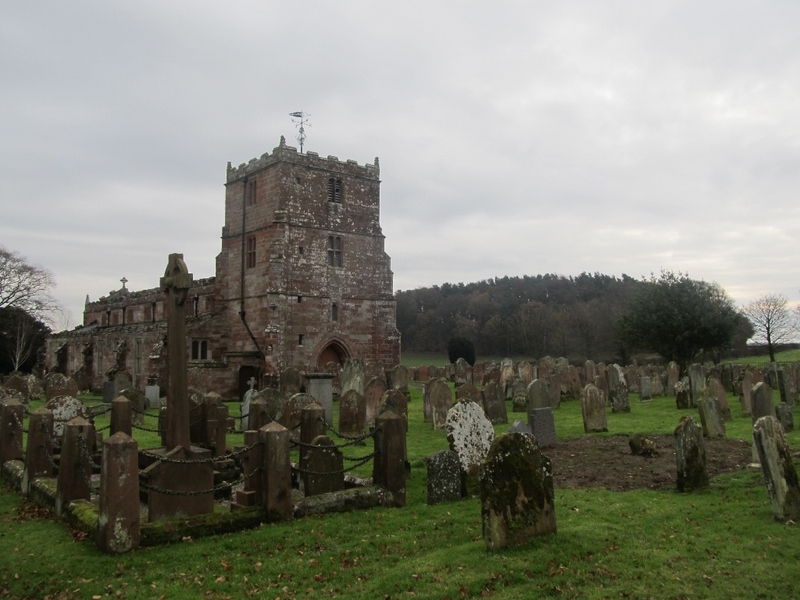 Some even believe that the legendary king himself lies buried beneath Arthuret parish church, and that perhaps the Holy Grail can be found there too… So I made the church my first port of call when I got there, and found it to be a very pleasant spot. But as a candidate for the last resting place of King Arthur, it is no more or less plausible than, say, Glastonbury, where the bones of the ‘king’ (and of Guinevere to boot) were ‘discovered’ in 1191. In the one case, an entire historical theory has been established on the distinctly shaky foundation that the name ‘Arthuret’ might possibly be derived from ‘Arthur’; in the other, the abbey greatly boosted its visitor numbers, and thus its income stream, as a result of the distinctly convenient find. Arthuret church: probably not the burial place of King Arthur. Probably. And that, in a nutshell, is the problem with a lot of the ‘Arthur industry’. Much of it can be attributed to attempts by one over-enthusiastic local historian after another to twist the miniscule amount of actual hard historical evidence about Arthur and his times to follow in the footsteps of the 12th century monks of Glastonbury by placing the fabled king within their own particular patch. Thus we have Cornish Arthurs, Somerset Arthurs, Welsh Arthurs, Cumbrian Arthurs, and a Scottish Arthur – or rather Scottish Arthurs, with a veritable battle royal taking place a few years ago between clans desperate to claim him as one of their own. The odd thing is that these optimists keep pushing their distinctly ingenious claims, despite the fact that a few years ago, Guy Halsall’s book Worlds of Arthur – which I read some months back – carried out what seemed to me to be a pretty effective demolition job on the whole business of Arthur myth-making. But then, and before legions of Arthur-loving trolls start laying into me, I should deploy the historian’s great catch-all cop-out, namely ‘it’s not my period’; or at least, it hasn’t been since about 1977. And let’s face it, books which claim that Arthur didn’t exist and didn’t inhabit a part of the country with a reasonably large book-buying population are never going to sell as well as books that say he really was a great warlord and that Camelot was that hill just up the road. Hang on, though. 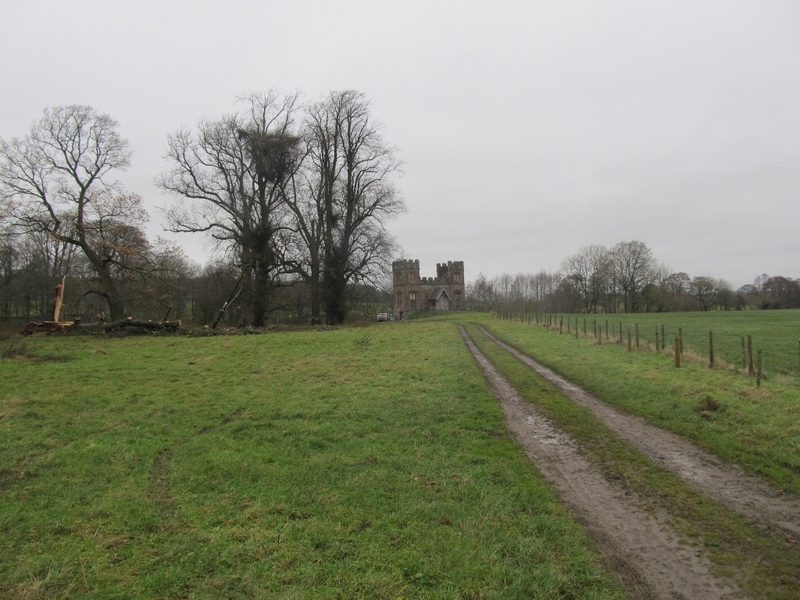 When I was looking for potential walks, I noticed on the map that only a few miles from Arthuret and the Coop House is the site of a Roman fort named Camboglanna. Hmm. Doesn’t that sound to you a bit like Camlann, the name of King Arthur’s last battle? And lo, Google the two names together and you’ll see plenty of websites which make precisely that connection. Then again, I’ve driven up and down the M4 many more times than I care to remember, and have always thought that the hill fort just by Junction 15 at Swindon would have been an obvious candidate for the site of the Battle of Mount Badon…and what’s the name of the place nearest to it? Badbury. At the end of the day, the Arthur myths are remarkably seductive, powerful and abiding, and who am I to argue with that? This will be the last post for this year; the blog will return on Monday 6 January. Next year, I hope to be posting about the fifth Quinton book, The Battle of All the Ages, which is due out in the spring or summer; revealing some exciting news about additional Quinton stories; and welcoming some more guest bloggers, including some very eminent naval historians who have never blogged before! Also, I’m giving a number of talks during the course of 2014, and it would be great to meet readers of this blog if you can come along. Confirmed dates early in the year are the Nelson Museum, Monmouth, on 11 February, and delivering the Captain Pack Memorial Lecture to the Society for Nautical Research (South) in Portsmouth on 15 March, in both cases talking about aspects of my latest non-fiction book, Britannia’s Dragon. In the meantime, I hope you all have a very happy Christmas and a wonderful New Year!